liuggio/excelbundle: (version >= 2.0) Allows the usage of the Excel export. The Real Missing Admin Generator for Symfony2! This package is a Symfony2 Admin Generator based on YAML configuration and Twig templating. It's inspired by fzaninotto/Doctrine2ActiveRecord. Don't miss any updates from Symfony2 Admin Generator! Join Twitter today and follow us! Flexible and extendable: you can easily add or overwrite almost everything! 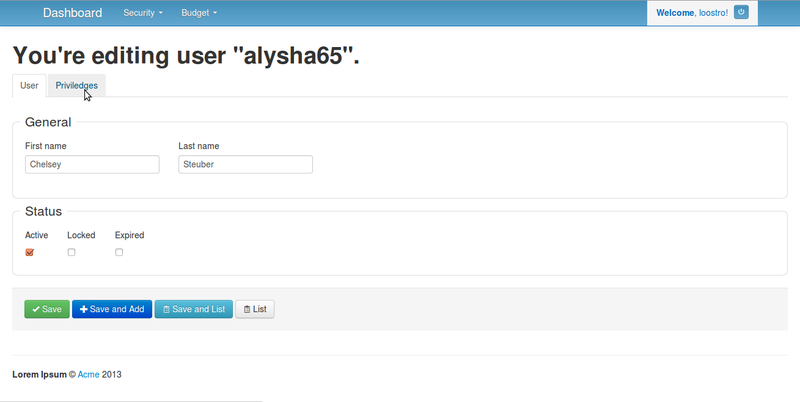 Introduces nested forms: create/edit object and all it's associated objects in one form! Sorry for inconvenience, we will fix that as soon as possible! The documentation for this bundle is located in Resources/doc directory. Start by reading Table of contents. If you're haveing trouble or you found an error feel free to open a github ticket, but first please read submitting issues.